However you prefer your yogurt—frozen, Greek-style, or fruit on the top or bottom—new research says to keep eating it for its healthy bone benefits. A recent study out of Ireland published in the journal, Osteoporosis International, tracked the bone density and joint deterioration of more than 4,300 adults 60 years and older. Data was collected via X-rays and MRIs over several years. A questionnaire regarding diet and lifestyle habits (such as smoking and drinking) was also completed by the participants. Additionally, the participants who reported a regular yogurt intake also performed better during the physical fitness portions of the study. 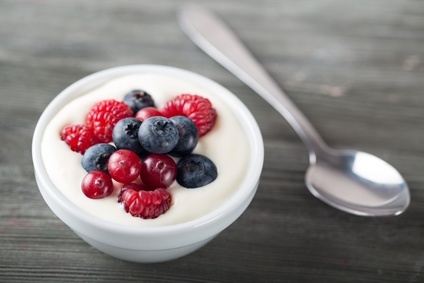 The results strongly support what other research has shown for years: yogurt is beneficial to bone (and overall) health due to its rich blend of Vitamin D, B Vitamins, calcium, protein, and probiotics. Other dairy-rich foods high in these bone-boosting nutrients include cottage cheese, kefir, and plain milk. The study cautioned that many of the processed yogurts available have added sugars and food dyes. Experts recommend choosing plain versions and putting your own spin on it by adding fruit, nuts, natural honey or agave sweeteners, and a sprinkling of cocoa powder, cacao nibs, or cinnamon. If you have questions about osteoporosis, or would like to schedule a bone density exam, please contact us for an appointment. Can Collagen Improve Joint Pain?